I am working with Jenny Hughes on some research for the Mature project. And in the course of developing a few research proposals Jenny asked me what Layered learning is. I had to admit I didn’t know. So it was off to Google. And up came an abstract of a paper by Kumar, Torr and Zisserman which contained the wonderful phrase “efficent, loopy belief propagation.” Wow!. I wish I had written that. Layered learning seem to have been developed by researchers working to program robots to play football. And basically it refers to breaking down skills and knowledge into a series of hierarchically defined layers. 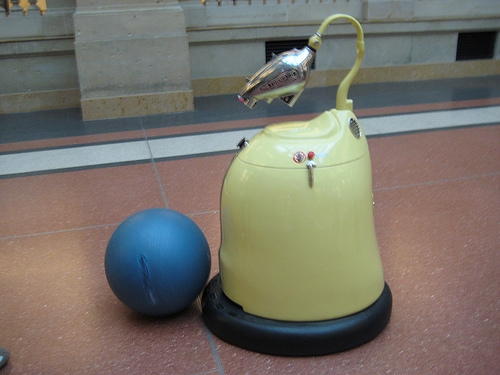 So you might teach a robot to kick the ball and to run. And you might teach them to watch what the other team is doing and to be aware of where their own team robots are and so on. And at the end of the the day you synthesis the different layers of learning to develop a football playing robot. Jenny questions whether people learn in this way. Of course sometimes we do synthesize chunks of learning to carry out a task. But just as often we may analyse a whole chunk of learning to derive the different skills and knowledge from it. In that way we can distinguish analytic learning from synthetic learning. And layered learning appears to focus solely on the synthetic learning process. Be glad to hear from anyone who knows more than me about this. Here is a curious story from the Guardian web site. “A school is employing sixth formers as supply teachers because of a shortage of qualified staff. Chalfonts community college in Gerrards Cross, Buckinghamshire, pays its 16-, 17- and 18-year-old sixth formers £5 for each 50-minute class they take. The 24 teenagers follow teachers’ lesson plans, instructing 11- to 16-year-olds in subjects they may no longer take themselves. The school trains them in behaviour management, lesson preparation and the importance of confidentiality. An older adult is with them in the classroom, but may not be a trained teacher and does not take the lesson. The school is thought to be the only one in the UK to have taken this approach to supply teacher shortages. …..John Bangs, head of education at the National Union of Teachers, said there was “every argument for older pupils to mentor younger ones”, but they should not be used as “quasi-supply staff”. As regular readers of this blog will know I have no problem with the idea of peer learning. But if the students are doing the work of teachers why should they not be paid the going rate for the job. 5 pound an hour is a rip off. And still more curious is the schools idea of what training the students need to teach – behaviour management, lesson preparation and the importance of confidentiality. Nothing about teaching and learning. Or rather ‘teaching by numbers’. Is this really what makes a good teacher? We have upgraded the Pontydysgu web site to WordPress 2.5.1. I have had only a limited time to look at it but it seems both a big and welcome upgrade. Particularly nice is the new dashboard – for non WordPress users, this is the back end where you do things. In the past the default view provided far too many options, many of which most users would seldom acccess. Now many of these features have been hidden, meaning you do not see them unless you need them. This is important for me. I know my way round the old Dashboard. But we are using WordPress MU for our Freefolio e-portfolio application. Not only do I worry at the barrier the dashboard design offers to new users, but in focusing on navigating the Dashboard users may be distracted from the primary use of the sofware – to develop their portfolios. It would appear that an update to WordPress MU to incorporate the new features of the WordPress single user version is planned int he near future. This is good news for us. The last in our one week series of live webcasts sponsored by the Jisc Emerge programme. If you missed the Emerging Sounds of the Bazaar at the Benefits Realisation day of the Emerge Conference, here is your second chance. The one hour live webcast was recorded and is now available as an MP3 podcast. You can listen in line or download the programme to your MP3 player of choice. George Roberts – the last poet in Oxford. Thanks to everyone who helped produce the programme and especially to the producer, Dirk Stieglitz. After yesterdays brilliant 24 hour Earthcast, we are happy to invite you to the next LIVE web cast from Sounds of the Bazaar. We will be broadcasting an hour long programme beginning tomorrow, Thursday 24 April at 1600 UK Summer Time, 1700 Central European Summer Time. The programme is part of the three day Jisc Emerge on-line conference. We will be featuring a number of the Emerge projects, launching the new Emerge Bazaar and hosting a phone in on the future of technology enhanced learning. And, as ever, spinning a few tunes from the Creative Commons supported Jamendo web site. Look forward to talking with you tomorrow. I’ve spent most of the day listening to the Earthday 24 hour webcast, Earthcast. The webcast was hosted by the World Bridges Edtechtalk. And it was so cool. I think this account from John Pallister on the e-Portfolios and PLTs list serve summarises perfectly the event. of all ages, and teachers from around the world talking to one another and broadcasting to anyone in the world that had an internet connection………. student who 5 minutes earlier was simply having a conversation with friends in the common room – then he found himself talking to the world! From an ordinary class room in County Durham, at no cost. responsible action to bring improvements for others as well as themselves.” AND a bucket-full of communication and citizenship skills. Life long learning, I learnt from a 6 Year old that by using www.Blackle.com rather that using Google I would save energy because the screen is black! I agree with John. It was a truly remarkable event. If you missed it the archives can be found here. The broadcasting fest of the weekend was a little stressful but lots of fun. And whilst podcasting is now pretty simple – and video is not a big problem – live radio is something else. Firstly presenting a live show is a completely different experience to podcasting. There is no chance to remix – it is going out live. You have to think on your feet. And it has a buzz to it which isn’t there in the podcast. The tech mix is still a little tricky. Saturday went pretty well. A few glitches but on the whole not a bad programme. Sunday was a disaster. Twenty minutes before we were due to broadcast something went wrong with our settings. I have a few ideas but am still not quite sure what it was. We reset our machine to overcome problems with the skype feed. And in so doing we totally messed up the feeds. Something was looping in one of the two machines we use to broadcast the programme. The result – dreadful sound quality. And whilst Pekka and John gallantly talked on through an near impossible echo, Dirk and me scrambled round trying to work out where the fault lay. Sadly it was to no avail. We ended the show disconecting the Mac Pro from he feed and with me taking into a Powerbook in built Microphone. After the show we tore apart the whole system and worked out a new set up. And yesterday it all worked. Thanks to everyone for their feedback. And thanks to all our guests. You can listen to the recording of the show here. I need to add a lot of links. No time now. However do check out the live Earthcast 24 horu show which is presently underway. Matt Montagne explains what it is all about in the first guest spot in this edition of Sounds of the Bazaar. You can access the Earthday web cast on http://edtechtalk.com/earthcast08. And check out Cristina’s blog on her work in the project. Many thanks are also due to Dirk Stieglitz who has bravely struggled with the technology. We are working on a how-to publication for those wanting to learn more about live webcasting. Monday 21 is the third of our LIVE Sounds of the Bazaar broadcasts. Todays show goes out at 1900 CEST, 1800 UK summer Time. We hope we have eradicated the bug which badly reduced the quality of yesterdays broadcast. Don’t forget todays LIVE edition of the Sounds of the Bazaar show. We will be broadcasting at 2000 Central European Summer Time, 1900 UK summer time. For other time zones just check the tiny urls in the news item below. Todays show features interviews with John Pallister form Wolsingham School on e-Portfolios and with Annika Matilda Bergstroem from Sweden. Our special guest is Matt Montgane who is going to be telling us about the forthcoming 24 hour Earthcast. And for todays show we will also have a chatroom running in parallel. Just click on this link to enter the chat. Don’t forget – you can listen to the programme by clicking here. This should open as a stream in your default MP3 player. And if you missed yesterdays broadcast, an archive version is now on line..
Well it worked! I was pretty nervous about the first LIVE broadcast of Sounds of the Bazaar. And for the first two minutes I talked too fast until Dirk, the producer held up a sheet of paper saying ‘slow down’. But it all went pretty well. Many thanks to Jan Lai who talked to us form a beach in Italy over a skype phone and also to Sigi Jakob from Germany who didn’t complain too much when I said she was from Austria! The software tells us we had about 50 listeners from around the world. If you missed the programme – or enjoyed it so much you want to hear it again – here is a recording. Cristina is trying to set up a chat board to accompany the show. More details tomorrow.